When you install your fiberglass grating from Marco Specialty Steel, you need to choose the right accessories. We have a wide range of fasteners and hold down clips available that offer different advantages and installation flexibility. It doesn’t matter if you choose our FRP molded, pultruded or phenolic grating systems. In all cases, we have the fasteners and accessories required for fast and durable installation. Marco Specialty Steel has all the fiberglass clip assemblies you need. We have the following clips for molded or pultruded grating. 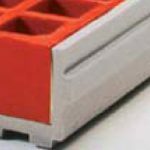 We offer specially designed attachments and clips that both fasten panels together and to secure them to support structures. All clips are made of type 316 Stainless Steel and are available in 1”, 1-1/2” and 2” sizes. 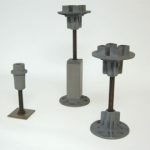 Type M Hold Down Clips: sometimes called FRP saddle clips, used to secure panels to a support using two adjacent grating bars for a secure fit. This provides excellent holding capability and because of this, are recommended for stair treads and most molded and pultruded fiberglass gratings. Type L Hold Down Clips: for lighter duty use in securing grating panels to support frames. Type G Hold Down Clips: designed to attach grating to any structural member flange, 3/4” or smaller in thickness, with no drilling required. The lower jaw of the clip grips the support flange when the bolt is torqued. A heavier top clip then completes the assembly to carry the loads. Providing excellent bi-directional holding capability for molded square mesh fiberglass grating. Type C End Panel Clips: provides a simplified method for joining side bars of panels that are butted end to end to minimize differential defections when their joints fall between supports. C clips are also used in grating leg systems for panel abutments. The lower nut is welded to clip so installation is from top side of fiberglass grating floor. C clips should be placed every 2′-3′ to meet industry requirements. Type W: designed to secure covered grating or Fiber-Plate to a structure. Type M Hold Down Clamps: 316 stainless steel clips used to secure panels to a support using two adjacent gratng bars for a secure fit. Type T Hold Down Clamps: for below the pultruded fiberglass grating surface attachment and should be specified in pairs as shown. Type J Hold Down Clamps: specified to hold one fiberglass grating load bar to the support for lighter duty loads. Surface flatness: Do you move a lot of carts, bags and containers across your grating? If so, you’ll want to choose recessed clips that don’t extend past the surface. These avoid catch points that can snag and tear bags and boxes and trap dirt, strings and other debris. See our collection of T-Clips for flush grating installation. Heavy load: If your grating will see heavy loads and frequent passage of carts, lift trucks and other vehicles, using a fastener with a larger surface area will increase the durability and stability of your grating. Our Pawl-Clips, G-Clips, CSM-Clips and W-Clips all feature an increased surface area that will hold your grating in place for a long time. 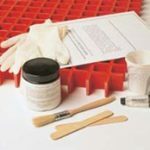 Chemical and humidity resistance: If you’ve chosen our FRP grating for installation in an environment with high humidity or the presence of chemicals, you need fasteners and accessories that will resist damage and corrosion. We can propose a variety of resistant materials for our different models of fasteners, and we invite you to contact us for more information. Access for installation: A final concern when choosing your FRP grating fasteners is whether or not you have access to install the fastener. If you have access top and bottom, you can choose any fastener, but if you only have access at the top side, select either our G-Clips or CCSM-Clips. These two-part designs feature a hook for securing to the support below. Why Do So Many Fasteners Exist? Many of our customers ask why there isn’t simply one type of clip for installing our different types of FRP gratings. That’s because we want to give you the most flexibility possible for your application. In some cases, a low-cost clip is enough to hold your grating in place, while in other cases you need more clamping force with our heavier-duty fasteners. When placing your order through Marco Specialty Steel for your molded, pultruded or phenolic fiberglass grating, remember to select the right fasteners for your application. If you’re not sure which clips are best, let us know. We’d be happy to discuss your installation with you and suggest the best fasteners. In some cases, you may need a variety of different clips for different locations or positions. At Marco Specialty Steel, we’re dedicated to finding custom solutions that suit you, so contact us today and let us help you find the perfect fasteners for your FRP grating.